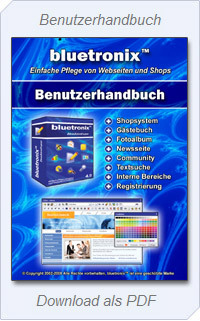 The bluetronixTM software is a hosted content management system (CMS). You can use this software if you have subscribed to one of our packages. This software is easy to use and has been developed especially for small business, companies, schools, associations/clubs and private users. Single visitor analysis - Where did the visitor come from? The Calendar shows an overview of your appointments. Manage your appointments and meetings here. Question-Answer-System with user import, password secured catalogue and upload of attachments. Immediately after you have ordered your web package you get your log-in details. You don't even need an email address.